Huge PS VR bundle deal lands you a Starter Pack and Move Controllers Twin Pack for only £229.99! This is one of the best PS VR bundle deals we've ever seen! 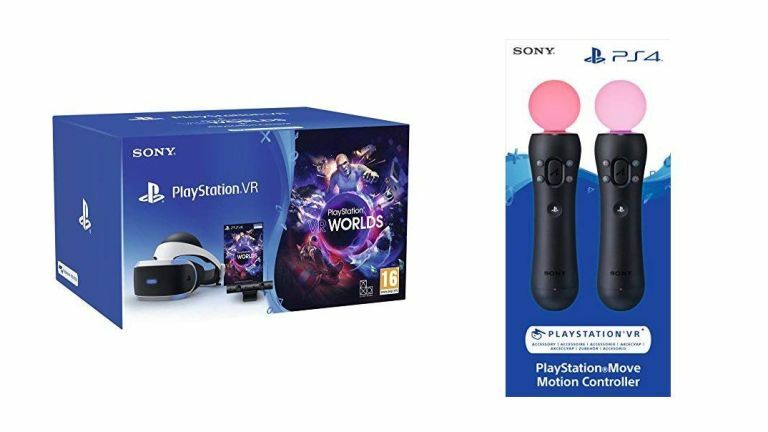 PlayStation 4 owners looking to make the step into VR should look this way, as the PS VR Starter Kit along with a brace of PlayStation Move Motion Controllers is currently down to only £229.99 thanks to Amazon Prime Day 2018. A -27% drop in cost over its pre-Prime Day price, that is a straight discount saving of £84.98, lowering the well-reviewed headset to a very, very attractive price point. This top Amazon Prime Day deal sees the PlayStation VR Starter Pack bundled in with a Move Controllers Twin Pack for only £229.99. That's a saving of £84.98 over its pre-Prime Day price of £314.97, which translates as a big fat -27% cost saving. Providing you everything you need to enjoy PS VR, this bundle deal is well worth a look if you are currently trying to get into virtual reality gaming. The PS VR Starter Kit includes everything you need to get started with PlayStation VR, including a PlayStation VR headset, PlayStation camera and PlayStation VR worlds. And, with the Motion Controllers, too, this package means you have the absolute best PS VR setup to enjoy the system's large library of games as well. A top Amazon Prime Day deal.